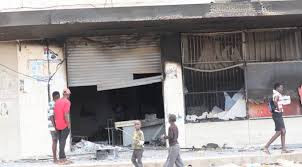 CHOPPIES Supermarket at Mkoba 6 shopping centre in Gweru lost goods worth more than $15 000 to looters who broke into the shop on Tuesday last week during the MDC Alliance orchestrated protests. This was revealed during Industry and Commerce Minister Mangaliso Ndlovu’s tour of Gweru on Tuesday. Minister Ndlovu was in the Midlands Capital assessing the extent of damage caused by the protests. Choppies management told Minister Ndlovu that the looters got away with goods worth more than $15 000. Minister Ndlovu said the perpetrators will face the full wrath of the law adding that Government was going to compensate the affected businesses. “It was very important that we come and see for ourselves. It is important that we assure the business people and the community that there is security and that they can resume their business. “We have seen the damage which was mostly the breaking of windows and doors, so people can quickly return to work,” he said. Minister Ndlovu said Government was assessing the damage caused by the protesters nationwide so that the perpetrators can compensate the affected businesses. “I want to reiterate and emphasise that perpetrators of this hooliganism will be brought to book and those who planned it remain liable to pay for all the damages. For us it is important that we assess the losses suffered by the business people so that we can map the way forward,” he said. In Gweru police arrested 16 suspected hooligans together with MDC Alliance national organising secretary Amos Chibaya and Chiwundura Member of Parliament Livingstone Chiminya.